There’s plenty of work to be done in Washington this year, work that effects veterans and civilians across the country. As the new Congress gets settled in, we’re making sure they prioritize veterans and the freedoms we fought to defend. 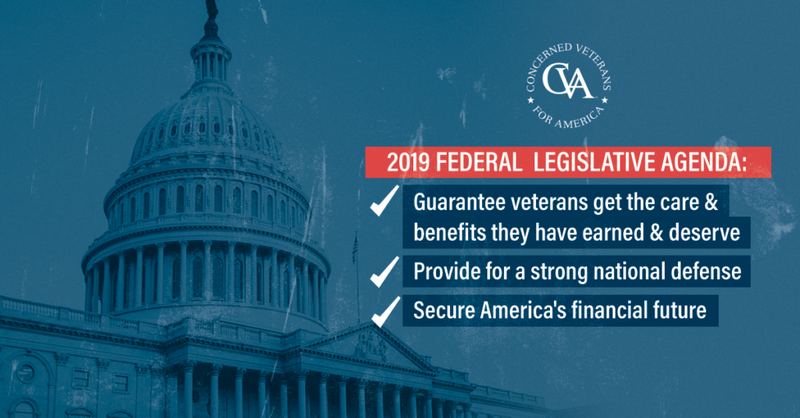 Yesterday, Concerned Veterans for America released its 2019 federal legislative agenda, outlining our targets for this year and the new Congress. As always, ensuring veterans get the medical care and other benefits they’ve earned is at the top of Concerned Veterans for America’s priority list. In the last two years, we’ve seen huge strides to reform the Department of Veterans Affairs. Our mission is to preserve those reforms and keep moving forward. Implementing the VA MISSION Act will be the most important thing the VA does this year. This law requires the VA to combine its community care programs into one comprehensive program and establish new standards for access to non-VA health care. It’s essential that the department follows the implementation schedule and is ready to roll out VA MISSION Act changes on June 6, 2019. Providing a strong national defense is among government’s most vital roles, if not the most important. Many of us took part in that mission, and we want to see it continue even though we took off the uniform. We’re focused on responsible and effective spending of defense dollars, tracking our spending on common defense relative to that of our allies and assessing congressional oversight of use of military force. For the Department of Defense to be efficient and effective, it first needs to understand how it spends money. The failed Pentagon audit completed just a few months ago found massive inefficiencies, especially in information technology. As the fiscal 2020 National Defense Authorization Act is crafted, CVA will advocate a Base Realignment and Closure round. A new BRAC round would give the DOD an accurate picture of the assets and facilities it owns, what isn’t being utilized and how it can better spend those dollars. CVA will also focus on America’s spending and use of military force around the world. We’ll be calling on Congress to reinstitute transparency of our allies’ contributions to shared defense efforts so we can make better foreign policy decisions. Congress must also revisit the 2001 Authorization for the Use of Military Force, which has been continually used to justify military action around the world. The world and foreign relations have dramatically changed since the AUMF was signed and Congress should have more oversight of military operations. Our government’s out-of-control spending habits have skyrocketed our debt and put us in a dangerous position. It’s time to make tough, but necessary, decisions about spending. The way Washington approaches spending and budgeting is irresponsible. We didn’t put on a uniform and protect the country only to watch lawmakers expose the nation to more danger through reckless spending and debt accumulation. We’ll continue demanding that Congress stop playing political games with the financial health of the country. Read CVA’s full legislative agenda.